The Stormont Estate witnessed its most activity for a year on Saturday 3rd February, as the Northern Ireland Civil Service AC hosted the penultimate round of this seasons Athletics NI Cross Country League attracting over 350 competitors to Belfast. In the senior mens 4.4 mile race Mark McKinstry (North Belfast Harriers) continued his excellent form winning in a time of 26.50, just ahead of Chris McGuinness (Foyle Valley AC) who took second in 26.57. Conor McGaughey (Derry Track Club) completed the top three in 27.51. The ladies race was a very closely contested affair with only 10 seconds separating the top three. Jessica Craig (North Down AC) won in 20.35 with Catherine Diver (Beechmount Harriers) second in 20.42 and Ciara Toner (Springwell RC) third with a time of 20.45. In the veterans race Springwell RC’s Gerry O’Doherty had another great run to finish third in the M60 age category with a time of 22.48. On Saturday 3rd February 2018, nearly one thousand competitors made their way to the scenic Antrim Castle Grounds in Antrim Town, for Race 6 in the Born 2 Run, ‘Run Forest Run’ Series, the Antrim Castle 10k race. Vincent McKenna (QUB AC), who has performed consistently throughout this series, once again dominated at the front, winning easily in 34.02. Mark Smith (Mallusk Harriers) took second place in 34.36, while Oliver Cook (PACE Running Club), completed the men’s podium in 34.55. In the ladies race it was pre-race favourite Cathy McCourt (Unattached) who won comfortably in 38.09. Following on from her win at last week’s Dungiven 10k Gemma McDonald (Ballycastle Runners) ran 39.07 for second place, with Kate Simple (Acorns AC) crossing the line in 42.17 for third. In the Junior Mens Category Springwell RC’s Joshua White finished 3rd with a time of 50.56. Springwell RC Results - 132nd Paul Humphreys 47.08, 169th Paul Quinn 48.16, 239th Joshua White 50.56 (3rd MJ), 278th Janet Patrick 52.16, 318th Andrew Kincaid 53.09, 354th Mary Brogan 53.53, 445th Deborah Archibald 56.48, 498th Roisin Walker 58.47, 626th Lorraine Abernethy 1.05.30. Following on from the success of last year’s inaugural event Finn Valley AC hosted the second Glenmore 10 Mile Road Race on Sunday 4th February. Taking in the scenery of Ballybofey and Stranorlar the route took competitors past Jacksons Hotel and out the Glenties Road before turning through Glenmore Estate and along the Glenties Road to Drumboe Woods before finishing in Stranorlar at Finn Valley AC. 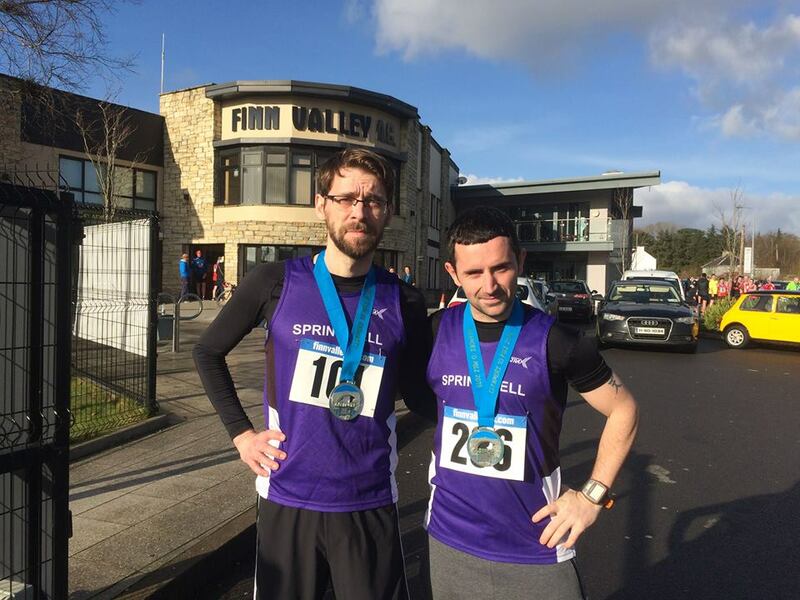 Springwell RC had two representatives at the event with Patrick Gallagher having an excellent run, finishing with a personal best of 1.08.08 and Will Colvin crossing the line in 1.21.23. Travelling a bit further afield this weekend Catherine Byers took part in Sundays Portsmouth Half Marathon. Finishing in 743rd, Catherine crossed the line in 2.26.08.